A North Charleston business is being accused of smuggling after a random inspection of a cargo container turned up a car that's popular with collectors because of its good looks and high speeds but illegal to import into the United States. All JDM Motors at 7411 Industry Drive also is accused in federal court documents of failing to report some auto parts and under-reporting the value of others shipped to the Port of Charleston in the container, which was among cargo the Grasmere Maersk vessel brought to the port's Wando Welch Terminal earlier this year. 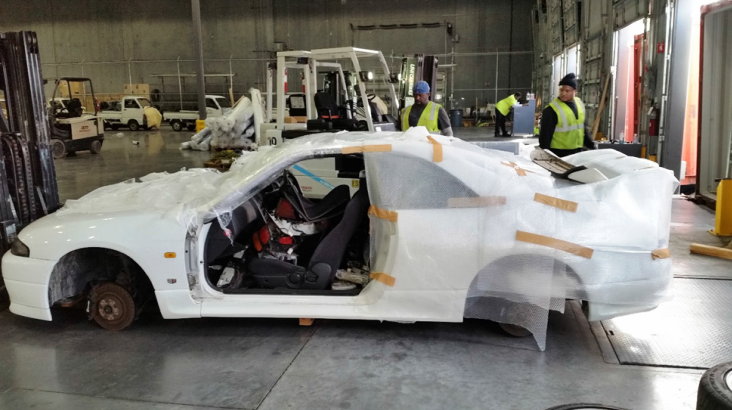 When they opened the container, inspectors with Customs and Border Protection say they found a bubble-wrapped 1996 Nissan R-33 Skyline automobile that had been placed atop two rows of used engines, transmissions and other parts. Federal agents located the ignition key, jump-started the battery and the Skyline "started up without any issues," according to court documents. The owners of JDM Motors — Ali Dost Mohammad Ali and Mohammad Didar Alizada, both Canadian citizens — could not be reached for comment Tuesday. No charges had been filed as of Tuesday. According to the search warrant, the Skyline was described on shipping documents as a "used breakdown car" worth $810. An import specialist working for the federal government determined that the car was valued at $51,355.39. Investigators this month served a search warrant on All JDM Motors, seizing a desktop computer, a laptop computer and miscellaneous documents to determine whether other illegal vehicles have been smuggled into the country by the North Charleston business. "It appears JDM may have smuggled and not declared another whole or half vehicle in an earlier container," according to court documents that show a photo of another car posted on All JDM Motors' Facebook page in December. All told, the North Charleston business has imported 18 cargo boxes through the Port of Charleston since December 2014, most of them from the same supplier in Japan. Nissan's Skyline is among vehicles banned by Congress in 1988 because they do not meet federal emissions or safety standards. The ban applies to new and used models that are less than 25 years old. Court documents show the Skyline allegedly imported by All JDM Motors would need about $20,000 worth of modifications to be legal to drive in the United States. Car collectors say speed is the main reason the Skyline is banned. The vehicle, featured in the film "2 Fast 2 Furious," can reach speeds topping 150 mph. In addition to smuggling, federal agents say All JDM Motors undervalued the Skyline and auto parts in the container by more than $107,000 to avoid duty and other fees. "JDM is under investigation for falsely classifying their merchandise, undervaluing their merchandise and smuggling goods into the United States," court documents state. The smuggling charge carries a maximum prison sentence of 20 years while the other charges are punishable by fines or prison sentences of up to two years.